Hi Lito, we spoke over the phone and I need to remove the decomposition odor from a 600 sq/ft room. I’d like to have enough in capacity to do 20% larger. Also I will need price on replacement filters. The unit will ship to Miami xxxxx. Thank you. We’re pleased to say we can help with this odor problem condition / situation. 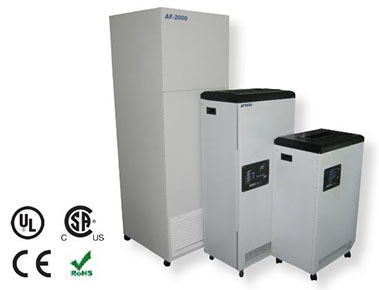 The answer, our BP2002 Pro Series Air Filtration System, Air Purifier, Air Scrubber. Built to meet the regulations for ventilation rates for spaces up to 1200 square feet, the BP2000 is equipped with a high quality blower motor which guarantee a very high volumetric flow rate. Refillable chemical filters: Contain carefully engineered filtration media blends to remove gases, odors, chemical vapors and volatile organic compounds (VOCs). 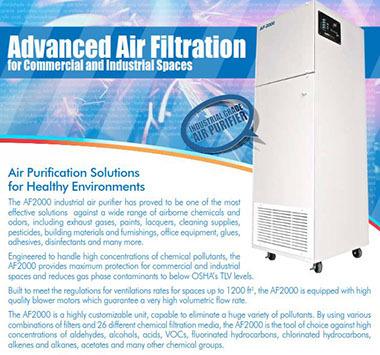 They contain carefully engineered filtration chemical media blends to remove gases, odors, chemical vapors, and volatile organic compounds (vocs). Contact us for help with your product selection, toll free, 1-800-626-0664, or fill out the contact form on this page. Will get back to you soon as possible. Strong odors, chemical fumes, that offgasses during and after printing can be reduced, if not removed completely, in your printing shop or printing room using a stand alone, recirculating, air filtration system configured with a sufficient amount of activated carbon filtration. Feel free to contact us for help with product selection. Deployment of our BP PRO Series stand-alone recirculating air filtration systems / air cleaners can help make a difference. Consider a filter configuration for dust and light odor – this normally comes with particulate filters, including a HEPA filter, and a chemical filter for the odor, usually an activated carbon filter. Depending on the size of the room or the desired number of ACH (air changes per hour) using one or multiple units can improve your office indoor air quality, making for a more enjoyable and healthy work environment. Contact us for help with your product selection, call toll free, 1-800-626-0664 or fill out the Contact Form below. Wherever you may be blessed to live in, be it in a castle, or a mansion, maybe an apartment or condo, a hotel room or a dorm room, you can breathe easier and healthier, cleaner air with the help of our BreathEasy series of air filtration systems, air cleaners, air purifiers. Dust, odor, fragrances, pollen and other particle allergens, chemical sensitivities and other allergies – we’ve got you covered – we can help you.